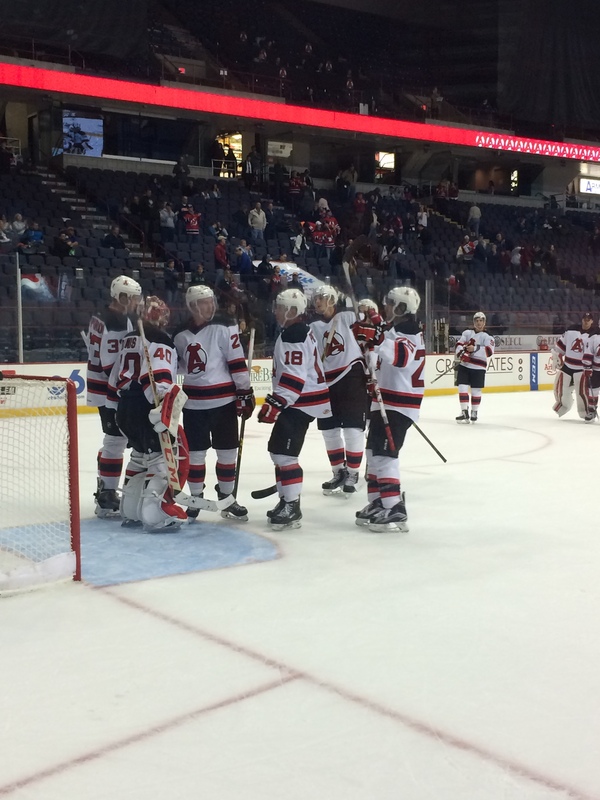 -The Devils begin the week with a 3-2-1-0 mark with a winning percentage of .583 and 7 points. They sit in 3rd place in the North Division with just a few percentage points between them and 4th place Syracuse. -Injury report: Scott Wedgewood (ankle) remains out, while Paul Thompson (upper body/shoulder) will be out indefinitely after being boarded on Sunday afternoon against Binghamton. As a result of the hit, Zack Stortini was given a 2 game suspension. Notes: After a 5 game winning streak to start off the season, the Sound Tigers have only won 1 out of their last 4 games, the lone win a shootout win in St. John’s on Sunday; former Devil Joe Whitney is leading the league in scoring with 11 points; after Friday’s game they return to Harbor Yard for a 5 game homestand to kick off the month of November. Notes: It’s been a slow start for the defending Western Conference champs since moving over to the East, only winning 2 of their first 5 games, all on home ice; the Comets have recently lost captain Alex Biega and forward Brendan Gaunce to recall by the Canucks; this is the middle stop of a 3 game road weekend for Utica, they begin Friday in Binghamton and travel to Bridgeport on Sunday. 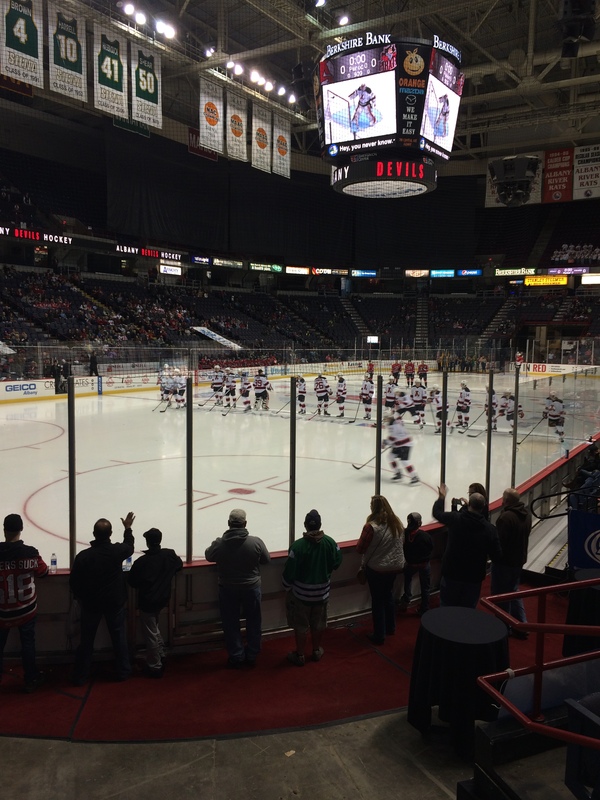 Notes: The last time the Marlies visited Albany? November 13, 2011, a 4-3 win in overtime; center Byron Froese, who had the tying goal in Toronto’s win over Albany on October 17th, was recalled by the Maple Leafs earlier in the week; NHL vet Richard Clune, who appeared in 8 games for the Marlies, has signed an NHL deal with the Leafs; Sunday marks the beginning of a 7 game road swing for the Marlies, who will head to Hartford, Utica, Binghamton, St. John’s, and Rochester before coming home on November 21st. It was off to Canada for the weekend, as the Devils took on a new divisional neighbor north of the border, looking to break through into the win column. And not a bad weekend, getting that first win and taking 3 of a possible 4 points. Yann Danis drew the start in net, while Dan Kelly, Ben Thomson and Matt Lorito each made their season debuts. Hitting the Ricoh Coliseum ice for the first time in nearly four years, both teams traded goals in the first period. Corey Tropp scored his first off of a tip in of a Dan Kelly shot 7:48 into the contest. 2014 1st rounder William Nylander would tie the game up late in the period for the home team. Barely two minutes into the second period, Mike Sislo would score on the power play for a 2-1 Devil lead. And with the strong play of Yann Danis in net, it looked like a Devil team may finally end up in the win column. Well…not so fast. The Marlies took over the game pace, outshooting Albany 14-3 in the third period. And with goaltender Antoine Bibeau pulled for a 6th attacker, Toronto would tie it up with 1:57 to go in regulation on a Byron Froese goal. It was on to the first 3 on 3 overtime of the season, where the Marlies would continue to dominate in their offensive zone, finishing off the comeback with 1:22 to go in the extra frame on a T.J. Brennan goal to stay undefeated. 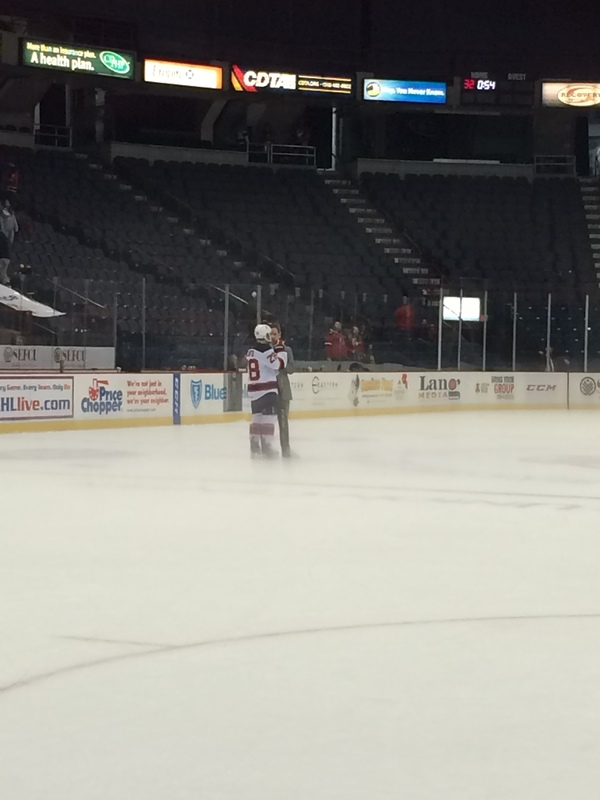 Despite the hard luck loss, Danis played well for a second straight bad luck start, stopping 34 of 37 shots. Matt Lorito (in his first appearance of the season), Kelly, and Brandon Burlon all contributed helpers. Power Play: 1 for 5. Penalty Kill: 3 for 3. Penalty Minutes: 15. Shots on Goal: 21. Shots Allowed: 37. 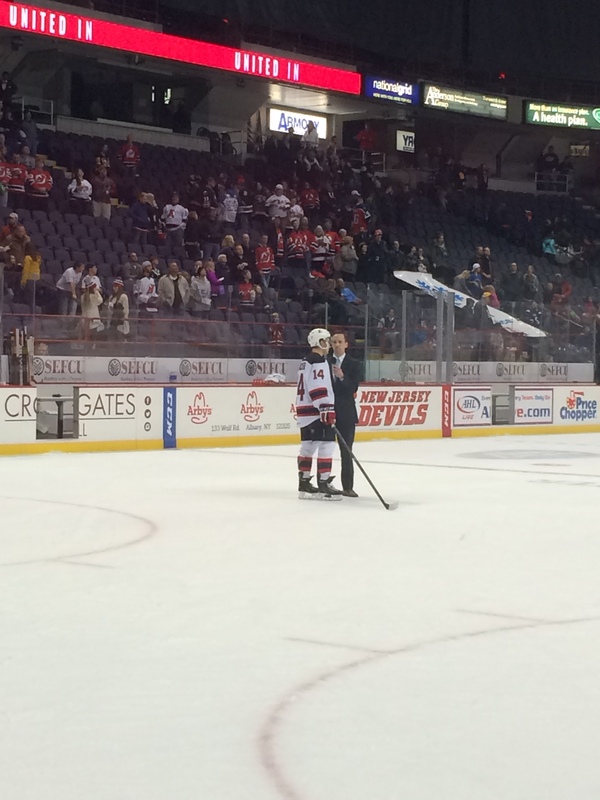 About 21 hours later, it was back on ice as the Devils looked to get that first win and split the set with the Marlies. Vojtech Mozik made his North American debut on defense, while Graham Black made his first appearance. After a scoreless first period the Devils would get things going early in the second period. While on the penalty kill, Jim O’Brien would score his first as a Devil shorthanded for a 1-0 advantage. Thanks to a miscommunication between Yann Danis and Marc Andre Gragnani behind the Devil net, Matt Frattin would score easily to tie the game up at 1. Kasperi Kapanen would get a no doubter just over a minute later and suddenly it’s 2-1 Toronto. But Albany wasn’t done just yet…on a power play with 6 minutes to go in the period, Mike Sislo would score his second goal in as many days to re-tie the game. 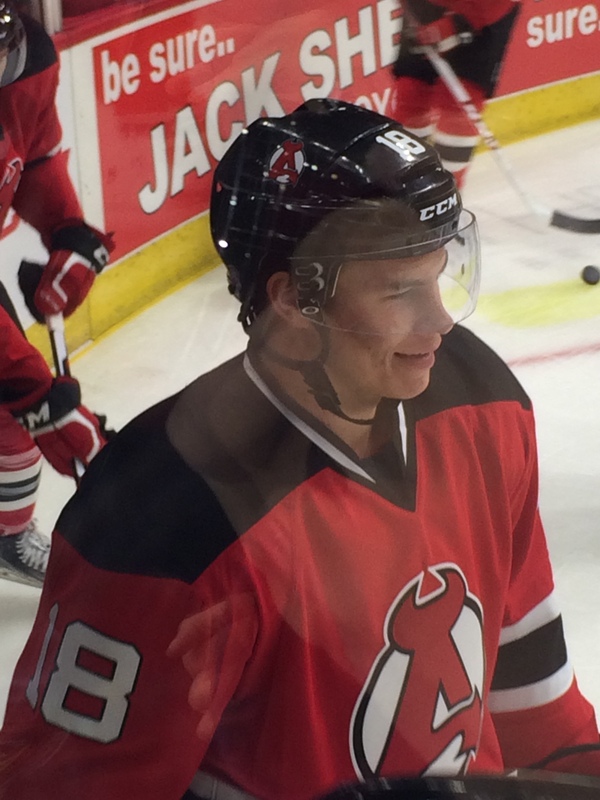 Then early in the third, Blake Pietila would score his first as a professional to give the Devils the lead back. Toronto had a golden opportunity to pull off what they did the day before, having a 6 on 4 for the last 1:30 of the contest, but Danis and the Devils would not allow it to happen, clinching their first victory of 2015-16. Danis had another strong performance in net, stopping 26 of 28 shots. Four Devils would contribute assists. Power Play: 1 for 5. Penalty Kill: 6 for 6. Penalty Minutes: 12. Shots on Goal: 31. Shots Allowed: 28. You can find them here courtesy of Leafs TV. The nod goes to Mike Sislo this week, for scoring twice on the power play in back to back days. Honorable mention to Blake Pietila for making his first pro goal a game winning one. This week’s throwback video features a pair of Devils during their college days. Here’s a big night for both Mike Sislo and Paul Thompson, playing for UNH against Vermont in December 2010 (with a cameo by former Devil Phil DeSimone as a bonus). 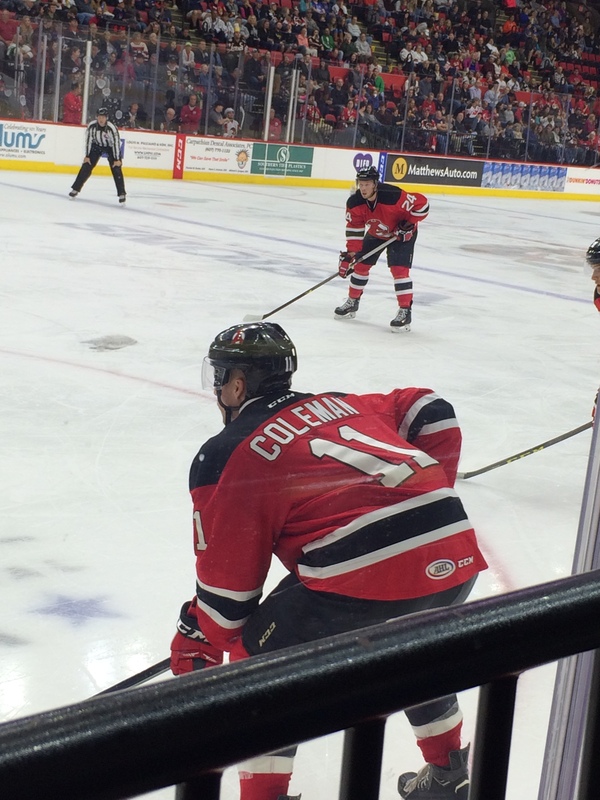 Adirondack kicked off their inaugural ECHL season with a 4-1 win in Elmira on Friday. Ken Appleby had a strong pro debut in net, stopping 29 of 30 shots in picking up the win, while Joe Faust contributed an assist. The Thunder travel to Brampton on Friday before a home and home set with Manchester on Saturday (home) and Sunday (road). It’s the ever popular 3 in 3 weekend! Friday night the Devils wrap up their road trip in Portland, before finally opening the home season on Saturday against the Pirates. Sunday afternoon Binghamton comes in for their first visit of the season. -The Devils begin the week 0-1-0-0, looking for their first points of the season. They are tied for last place in the North Division with Utica, who also sit at 0-1-0-0. 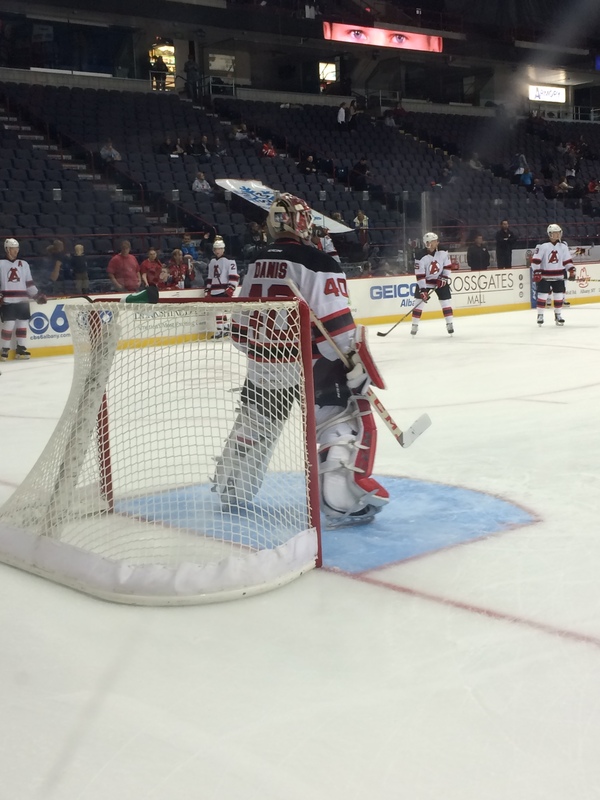 -First recall of the season to New Jersey goes to…Yann Danis, who was summoned to back up Keith Kinkaid Tuesday night at home against Nashville while Cory Schneider became a first time dad to a baby boy, Wyatt. He was officially sent back to Albany on Wednesday, while Reid Boucher was sent down and recalled on paper to make room. Ken Appleby was recalled from Adirondack for a day before being returned to the Thunder. -Injury report: All but Scott Wedgewood (ankle) will be available to play this weekend. Where: Ricoh Coliseum, Toronto, Ontario, Canada. When: 3:00 PM both days. Record: 2-0-0-0, 4 points, 1.ooo winning pct, first place in North Division. This is the first matchup between the two teams since December 10, 2011, a 4-1 Toronto win on home ice; the Marlies are finishing up a four game homestand to start off the season, including a sweep of Manitoba last weekend; games will be televised on RogersTV in Canada. Oh, Opening Day. It’s a wonderful thing when the first game of hockey season that counts arrives. New players, new promise, and the hope that you can start off on the right foot on your quest for the playoffs and the Calder Cup. The Devils began their sixth season on Saturday evening with a new look lineup and hopes that they can build on their near playoff miss from last season. But it was in Binghamton…and whenever Albany goes into that building, everything seems to happen. And not in a good way. With Scott Wedgewood out due to injury, Yann Danis drew the starting assignment in net. 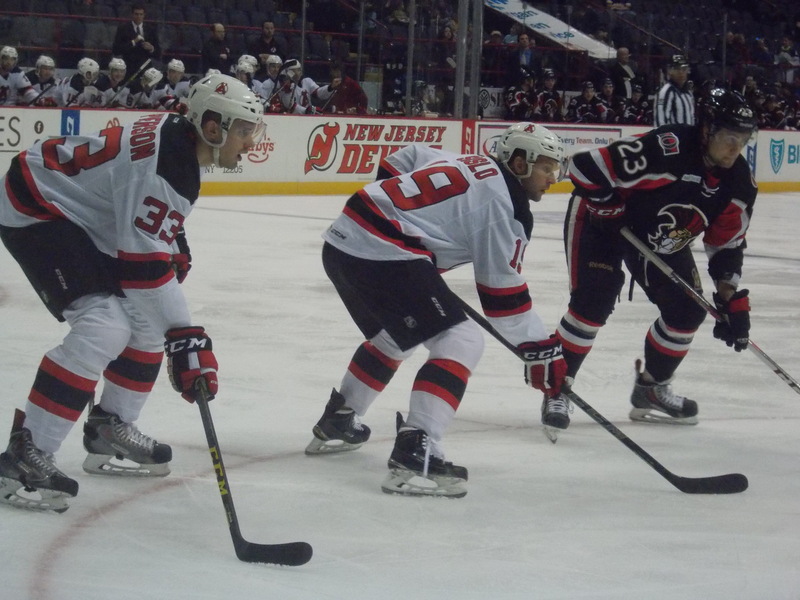 Also making their Devil debuts: Joseph Blandisi, Blake Coleman, Jim O’Brien, Marc-Andre Gragnani, Blake Pietila, Ryan Kujawinski, and Corey Tropp. 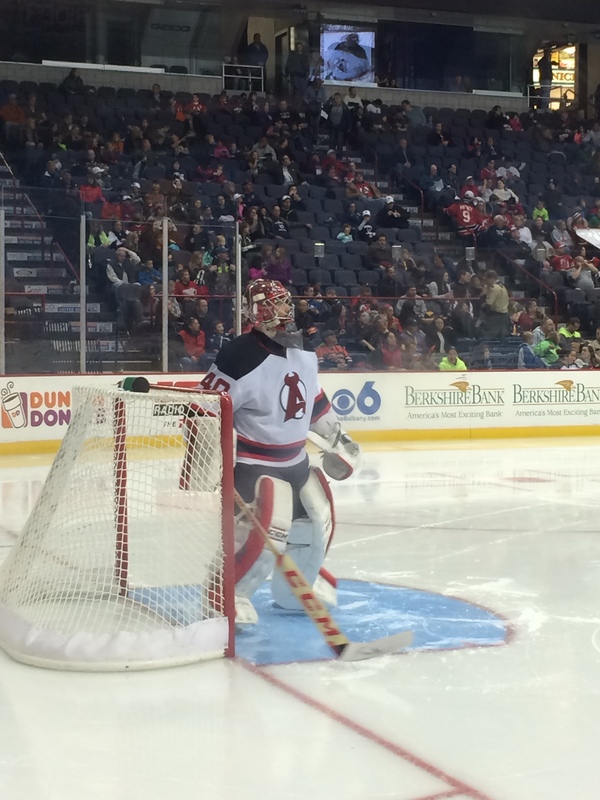 Pierre-Luc Letourneau-Leblond made his first appearance back in an A-Devil uniform since April 10, 2011. In the first, both teams would exchange power play goals. Colin Greening would put the home team up first just 16 seconds into the first penalty kill of the season halfway through the period. 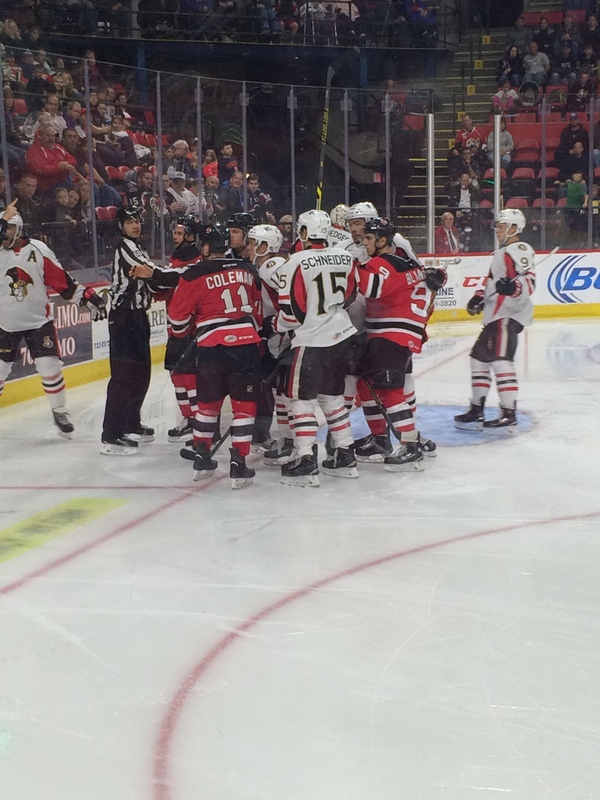 Joseph Blandisi would return the favor with his first professional tally on the back end of a 5 on 3 chance (well, 5 seconds after the 5 on 3 portion ended, anyway) to tie it up. 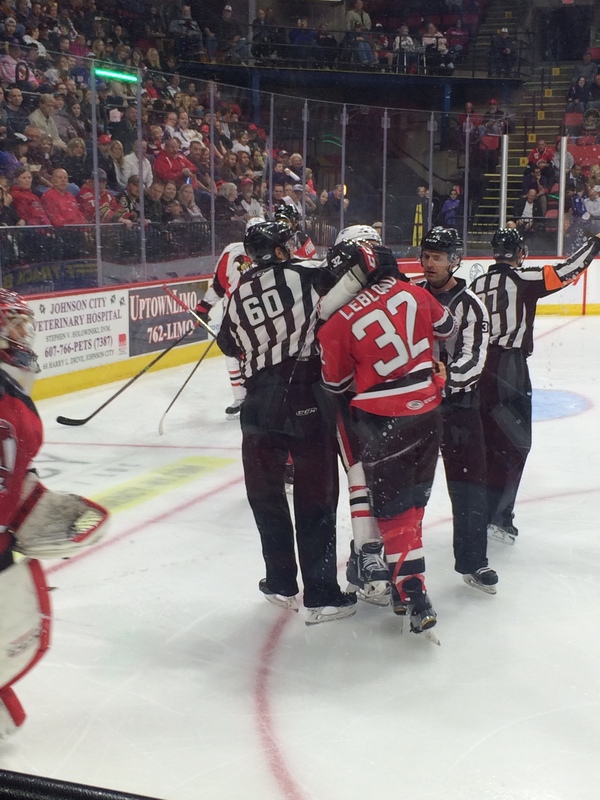 Second period things appeared to be swinging in the Devils favor, with more offensive zone play and just 2 penalties called against (including the ever popular playing without a helmet penalty…Tropp missed the memo on that one), but nothing past Binghamton goaltender Chris Driedger. Eric O’Dell would break the tie late in the second period…and after that, the bottom would fall out for the visitors. The curse of the building, among other things, would take over in the third period, as Albany could only manage 5 shots on goal. David Dziurzynski and O’Dell would score 6:53 apart to put the game away for the hosts. And then there was the discipline, or should I say, lack thereof (it also didn’t help that the lone referee missed a few blatant calls)…31 penalty minutes total for the period, including losing both Seth Helgeson and Raman Hrabarenka late in the game due to a scrum in the corner. Danis played well in defeat, stopping 28 of 32 shots, while Gragnani had the lone assist. The daily Well. That escalated quickly. Power Play: 1 for 6. Penalty Kill: 3 for 4. Penalty Minutes: 37. Shots on Goal: 33. Shots Allowed: 32. My first choice for the season–drumroll please: Yann Danis. Despite the loss, he had a good first night in net filling in for Scott Wedgewood. On Saturday, Ken Appleby was reassigned to Adirondack, and was immediately put to work, starting the Thunder’s preseason opener in Glens Falls, a 5-4 overtime loss to Manchester. He stopped 23 of 28 shots, while Alexandre Carrier scored in the first period. Joe Faust also saw action and finished with a +1. Adirondack will travel to Manchester Sunday afternoon to finish off the home and home series with the Monarchs, then the regular season begins on Friday evening in Elmira. The road swing to start the season continues to the northwest, as Albany travels to Toronto for the first time since the 2011-12 season for a two game weekend set. Both games on Saturday and Sunday are 3:00 afternoon starts. Also this week…Fanfest at the TU Center on Wednesday! There may be a few items tweeted from that, so stay tuned. With fellow division mates Rochester and Toronto starting off their season last night with wins, Albany starts the year in a tie for second with the rest of the North Division. Injury report: Graham Black (lower body), Vojtech Mozik (knee), Matt Lorito (lower), and Scott Wedgewood (ankle) will not be in the lineup on Saturday. Where: Floyd L. Maines Broome County Veterans Memorial Arena, Binghamton, NY. Season Series: First meeting of 8. Future matchups: October 25th, November 27th at Albany; March 11th, April 1st at Binghamton; April 3rd at Albany; April 9th at Binghamton; April 13th at Albany. Record: 0-0-0-0, 0 points, tied for 2nd in North Division. The Senators return 16 players from last year’s team, including third leading scorer Cole Schneider; second year pro Chris Driedger is expected to get the starting nod in net; former Devil Mark Fraser signed a 2 way deal with Ottawa and is on the roster.